Definition at line 50 of file pose_model_state_space.h. Definition at line 53 of file pose_model_state_space.h. Definition at line 59 of file pose_model_state_space.h. 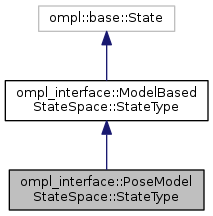 Definition at line 64 of file pose_model_state_space.h. Definition at line 69 of file pose_model_state_space.h. Definition at line 74 of file pose_model_state_space.h. Definition at line 82 of file pose_model_state_space.h. Definition at line 90 of file pose_model_state_space.h.